Shortly after IPCPR, I was offered the opportunity to try a few new Pinar del Rio blends and absolutely jumped at the chance. It’s no secret I’m a fan of some other cigars that come from Abe Flores’ factory in the Dominican Republic – notably, his PDR Small Batch maduro and the Biography he produces for Frank Herrera (which is a top-three cigar from 2012 to my tastes). 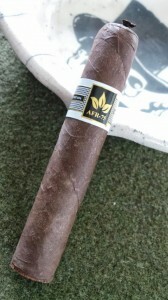 Today, I’m smoking the AFR-75 Sublime (5″X56). The line takes its name from Abe Flores’ initials and year of birth, and is a quite limited production run of 500 boxes per vitola in 3 different sizes (the other two being the Edmundo at 6″X58 and Immenso at 7″X60). 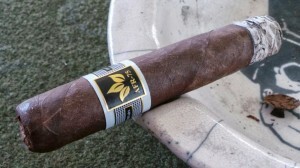 It also features a San Andres Maduro wrapper, and filler/binder mix of ’98 Nicaraguan Criollo, Connecticut Broadleaf, and Dominican tobaccos. For this review, I’ve smoked two samples, provided by PDR. The PDR AFR-75 comes with a lovely medium chocolate-brown complexion, evenly colored, and with no mottling whatsoever. It has a lightly oily appearance, some very fine tooth, and moderate veining. There is one significant vein turned to the outside of the wrapper on the second sample, but they’re generally light in appearance. I did notice on both cigars that the wrapper had retreated slightly from the bunch near the foot, a tell that indicates it has been properly held for some time before release. I did not notice any soft nor dense spots in the pack. Overall, both have been solidly built and provided near-perfect draw resistance. Before light, the wrapper aroma smells strongly of cedar; the foot as well, with perhaps some hay. With the application of fire, the AFR-75 starts off with a bang; tons of spice on the soft palate; not quite so bold on retrohale, surprisingly. I rarely will use red pepper as a flavor descriptor, but in the first few minutes of the AFR, that’s exactly what I’m reminded of. The spice, as perceived across the soft palate, is capsaicin-like. It leaves a slight lingering tingle behind through the finish. Within a few minutes, this has tamed considerably, however. By the five minute mark, it had subsided and left behind a very enjoyable, much softer, tropical spice. This, as I’ve mentioned in a few previous reviews, is more akin to some Caribbean cooking spices than the earlier mentioned red pepper. It’s something I personally enjoy and actively seek out in a cigar. Just the right amount of that first “bite” remains to keep this stick pleasant and interesting. The middle portion of the PDR AFR-75 brings a more cedary profile. 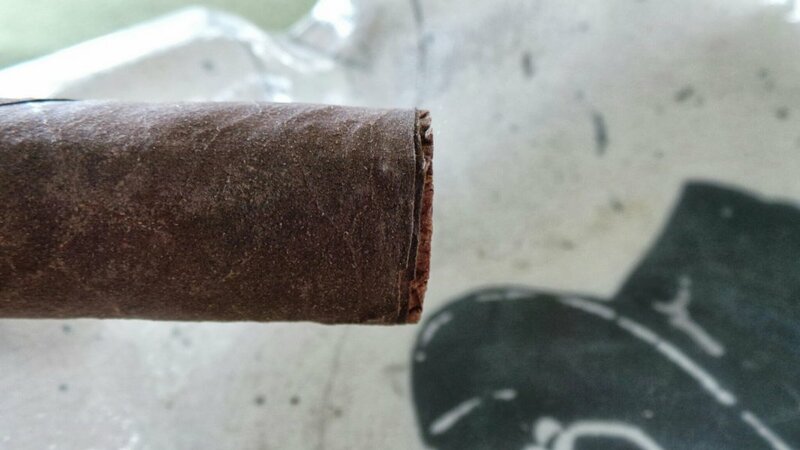 The cedar that was so apparent on the wrapper aroma before lighting has been largely missing from the early portion of the cigar, but now begins to build significantly. Halfway through this portion, it has become the clear dominant flavor – and will remain so until the end of this portion of the cigar. In the final stretch, there was some early fade from the cedar into a sweeter profile, akin to dark chocolate. However, this was fleeting, with the cedar soon returning. I have to admit the AFR-75 never became bitter, all the way to the very end. In fact, both my samples were finely crafted, deliciously blended cigars. The only possible cause for pause for some will be the pricing, which pushes the $15 mark at full retail. I have certainly paid more for less enjoyment in a cigar, but I know many in the marketplace may view that with a very skeptical eye. I still hold that the AFR-75 carries its weight and is definitely worth investigating. With its limited nature, presumably dear components, and admirable performance in my experience, I expect it will yet do well in the market. It is definitely worth the investment and investigation if you are at all a fan of PDR Cigars (as I find myself increasingly so).